Lumiere provides a diverse range of photographic art through its own proprietary collection, regular exhibitions and acquisition activities on behalf of clients. The gallery has work from more than 75 photographers. They range from masters of the 19th and 20th century to more contemporary practitioners. All are established, with works in important museum collections, as well as having participated in multiple exhibitions. Parking: Lumiere is located in The Galleries of Peachtree Hills, midway between Buckhead and Midtown. Once you enter the complex, the gallery is located in building five, the furthest from the gate, and is on the second floor (unit 29B). Free parking is available. MARTA: Take the North or South line to the Lindbergh Marta Station. Exit the station and go to Lindbergh Drive (Lindbergh and Piedmont are the roads that intersect at the station). Take a right onto Lindbergh and then a left onto Peachtree Hills Avenue just after you go under the train overpass. 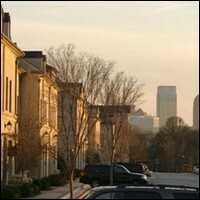 The Galleries of Peachtree Hills will be on your left about 700 feet ahead.